← Skip Your Annual Physical? Recently, Google opened its own coffee shop on its campus in Mountain view, Calif. Branded the Coffee Lab, its décor is reminiscent of a Starbucks, with warm wood paneling, plush upholstered seating and chalkboards that advertise daily specials and upcoming live music. This action is not headline news— especially when you consider how many corporate campuses have coffee shops on location. But it’s a signal that the landscape of workplaces is changing. More than just a workplace fad, the merger of first- and third-place attributes signals a long-term change in the way work is happening around the world. During the last few years, work has become dramatically more intense. Business tasks today are more varied and more challenging, and in some countries workers are increasingly mobile and distributed. Some organizations embrace the idea of employees working in a coffee shop or other third place for a variety of reasons. Employees may need places where they can relax or work undisturbed. Or organizations may simply want to manage their real estate costs by having fewer bodies in the office. Other organizations feel strongly that people need to be together in the workplace in order to innovate and do their best work. And in many countries, the culture or the availability of “third places” simply does not support a mass exodus from the primary workplace. Regardless, employees in every organization are working longer and harder, and they need a physical environment that not only supports them, but also re-energizes and inspires them. But is mimicking the local coffee shop at work enough? Is it giving workers what they really need? Is it possible that a third place in the office could provide an even better experience than the places employees find outside of work and create a place where real work can happen? People may seek out a third place because of its inherent good qualities—the ability to work without colleagues stopping by, lounge furniture with a home-like feel, the energizing buzz of people, access to good food, an attractive ambience. Today, we can thank Starbucks and other coffee shops for the modern-era third place, which has disrupted the work experience and caused its own revolution in the workplace. As Oldenburg noted in his seminal “The Great Good Place,” most third places revolve around beverages. While fast-food chains grow at a rate of only 2 percent per year, coffee shop chains grow more than 10 percent annually, one study found. There is something about a coffee shop that brings people in and keeps them there. According to workplace consultants Flex + Strategy, 31 percent of full-time employees in the United States do most of their work away from their employers’ locations. The draw to third places and the addition of third-place attributes to the office is strong and getting stronger in places such as North America and The Netherlands, though it’s not as prevalent in other locations around the globe. But that doesn’t mean that employees worldwide don’t desire similar things. In Asia Pacific, limited real estate often doesn’t allow for full-size Coffee Lab–type office additions. Yet companies everywhere realize the benefits of the third place and are looking for ways to add elements of that experience in smaller footprints. In many European countries, workers don’t usually go off-site to work, but they highly value social connections and benefit from environments that support them in the office. He suggests that workers who tried going off-campus to coffee shops met challenges beyond their control and are now seeing the advantages that only a workplace can provide. Coalesse is bringing the comforts of home and community of third places to the workplace to make the office the best place to work. Even in countries where work and personal life have been distinctly separate, workers are either choosing or acquiescing to have more of their work life and non-work life better integrated. These changing attitudes, coupled with the intensity of work today, are causing organizations to radically rethink their workplaces, and merge the best of the first and the third place to foster higher levels of employee engagement. 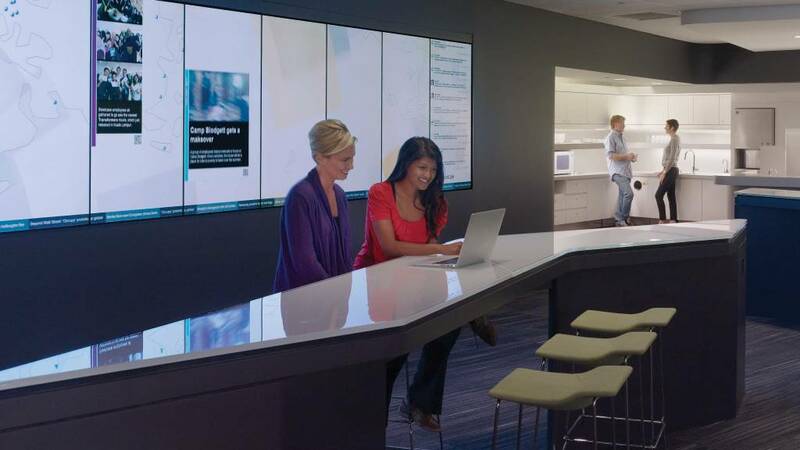 Corporate third places that accommodate real work must provide great technology solutions. Spaces with integrated technology are the most heavily used. 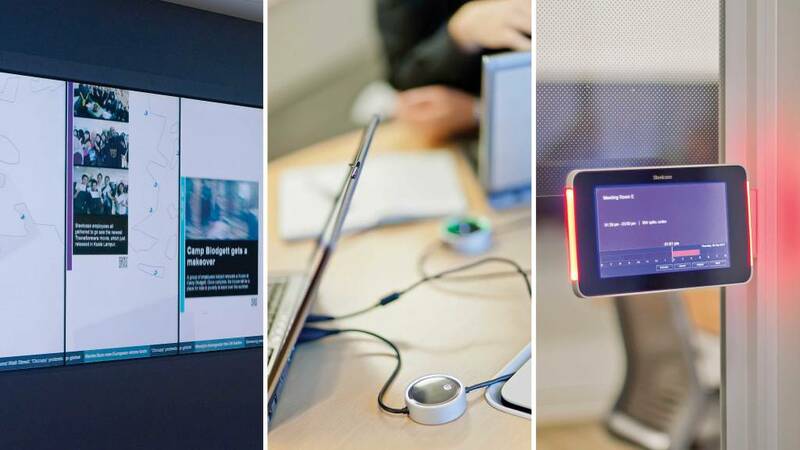 Displays for sharing and reviewing information, both digital and analog, help teams gain understanding and alignment. People may seek out a third place because of its inherent good qualities—the ability to work without colleagues stopping by, lounge furniture with a home-like feel, the energizing buzz of people, access to good food, an attractive ambience. But there are also inherent downsides. Comfy furniture might not be so comfortable when you have to sit in it all day. It doesn’t always properly support technology devices or allow workers to spread out reference materials. Creating a highly effective corporate third place involves more than access to good coffee and Wi-Fi—it’s about integrating work and life. Provide a range of spaces from which employees can choose to work, based on their mood and task. That energetic buzz means a certain level of distraction and a lack of privacy. Phone conversations are almost impossible to conduct and meetings for more than two people are not very productive because it’s difficult to share or visually display content. Plus, everyone knows the feeling of struggling to connect to Wi-Fi in a public place, not to mention the lack of power outlets. Many devices run out of power before work is completed, interrupting workflow. And there’s the very practical issue: What do you do with your stuff if you just need to use the bathroom or walk around a bit? Are your personal belongings secure? 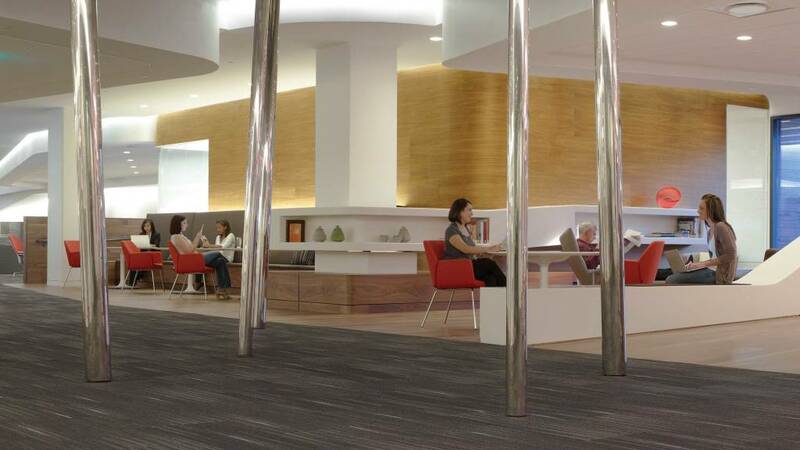 In leading the interior design effort for Steelcase’s global headquarters reinvention, Cherie planned the new spaces to help unify a global enterprise. While ambiance is critical to the success of a corporate third place, it’s useless without additional functionality for workers. The ability to choose and control where and how they work is essential. What is it about that third place, anyway? What gives it its mojo? Lisa Waxman, a professor of interior design in Florida, found that people desire cleanliness, aroma, adequate lighting, comfortable furniture and a view outside in their coffee shop. 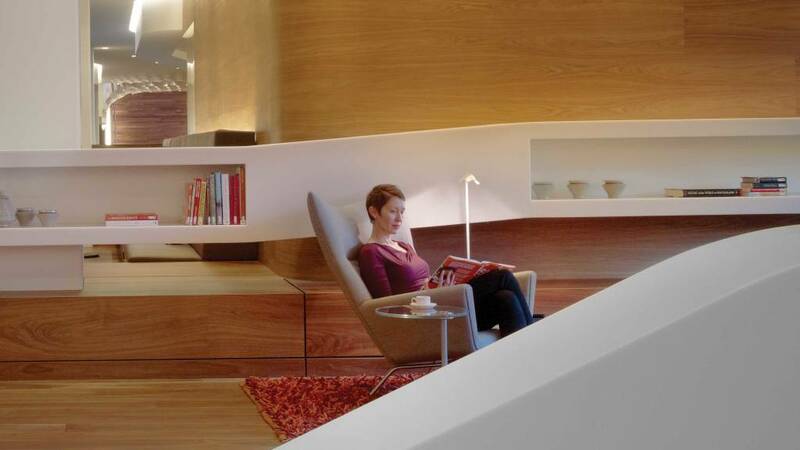 These characteristics build emotional attachment and describe that nebulous concept, “ambiance.” Steelcase has found that 49 percent of employees say that they don’t have a place with ambiance where they can recharge, reenergize, as well as work—something essential for employees who work longer and longer days and fight burnout. While ambiance is needed, it’s useless without additional functionality for workers. Design elements create the ambience of a corporate third place and influence worker reaction. The space should feel welcoming and give people a sense of belonging. “The third place on campus is really beneficial because you have those affordances of more casual work and being in the buzz and feeling connected to others. But because it’s on campus, you also feel that there’s an inherent level of privacy that you don’t have in a public domain. You can have important conversations and not worry about people seeing your screen or overhearing you,” says Barnhart-Hoffman. Third places are important crossroads for people throughout the organization to come together and feel a sense of belonging. The space not only encourages social interaction which is vital for employee engagement, but also makes it easier for people to meet and collaborate while still enjoying the vibrant buzz of the environment. 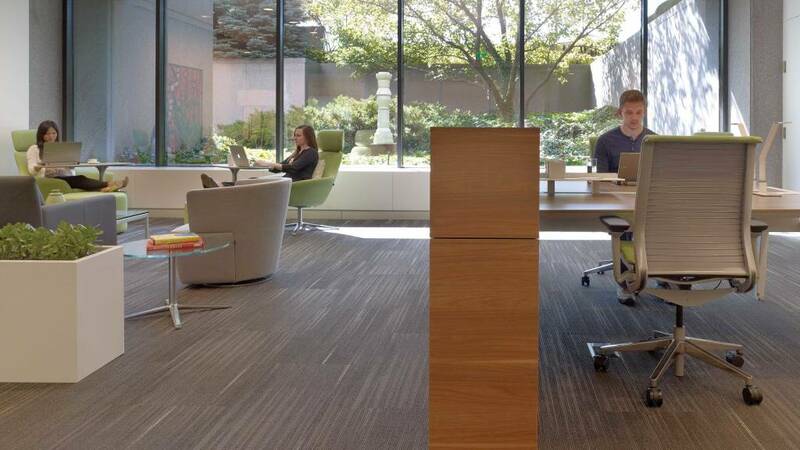 In 2009 Steelcase identified that its 20,000 square-foot cafeteria at headquarters in Grand Rapids, Mich., was an untapped opportunity to optimize its real estate and change its culture at the same time. The cafeteria was only being used during lunch or break hours—and sat empty the rest of the day. 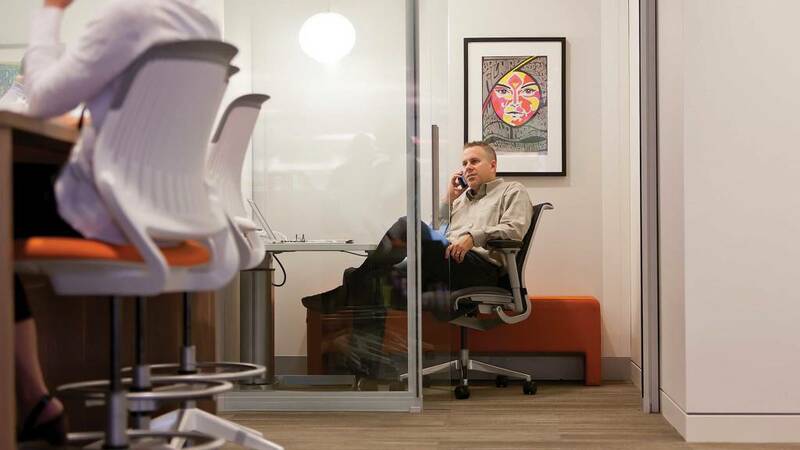 Read more about Steelcase’s real estate transformation in the Space Odyssey story. It was on the lowest floor and only accessible down a long hallway. And the subdued lighting and circa 1983 burgundy color scheme were hardly inspirational. A team renovated the space into what is now known as the WorkCafé and transformed the underutilized real estate by creating an on-site third place where people can meet, work, network, socialize and reenergize. Unlike a typical corporate cafeteria, a WorkCafé provides a combination of working and dining environments. 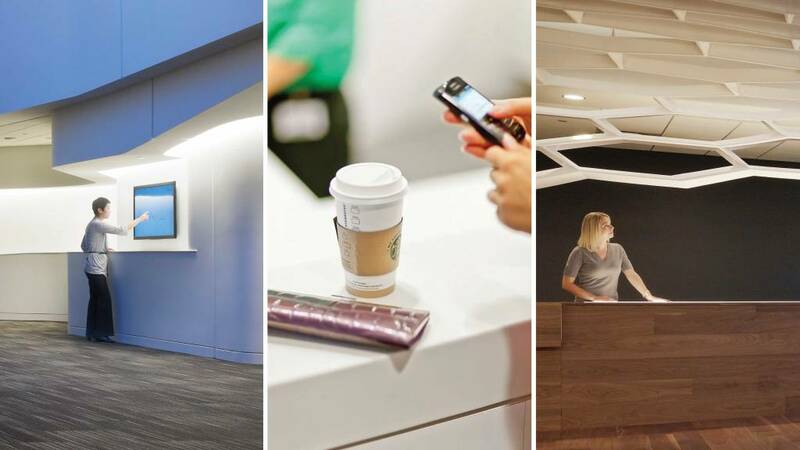 In addition to creative, healthy food and beverage options, it offers workers a variety of work environments that accommodate individual work, as well as small and large group work where people can engage in a wide variety of activities. 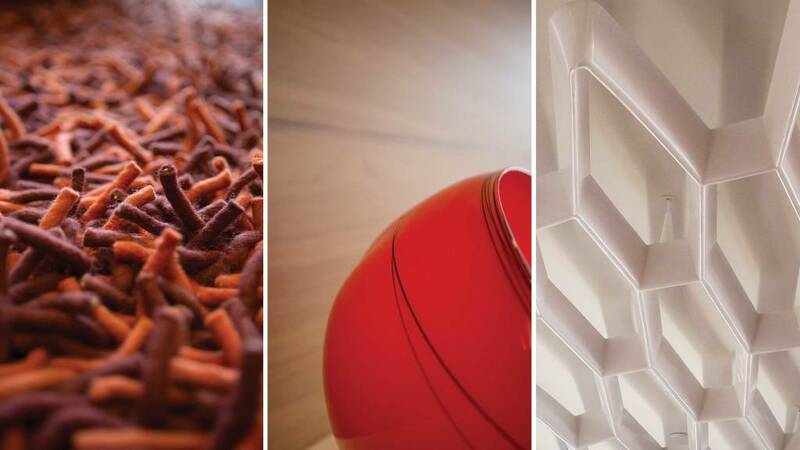 Creating a corporate third place is not only the domain of office furniture companies or design firms. And it’s not an option only for organizations with lots of extra space. The concept can be implemented in companies of all types, and it’s scalable for large and small footprints. The key is to approach a third-place project with a tested, successful strategy. Services for workers such as access to power, Wi-Fi, presentation support, electronic scheduling systems and content sharing tools are essential. More than anything, highly effective corporate third places that accommodate real work must provide great technology solutions. Users come to the corporate third place for refreshment and with the expectation that the place will provide what they need for effective performance, so technology needs to be immediately available and convenient. Every mobile worker is familiar with the frustration of unreliable Wi-Fi or limited outlets. Technology must be seamlessly integrated to support effective use of the third place, which in turn facilitates high performance for every user. Spaces should include technology that supports information sharing, content creation and effective collaboration for local and distributed workers. 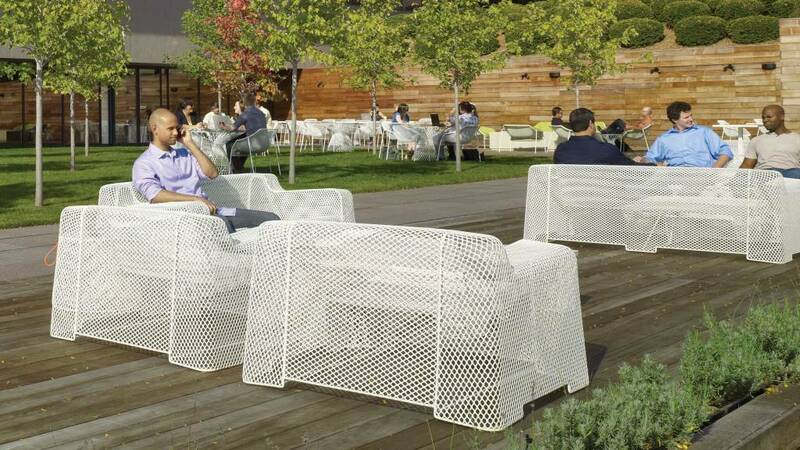 All spaces should have access to power—even outdoor spaces. Scheduling technology that’s integrated into shared spaces assists workers, both on-site and remote, in selecting the best place for their work processes and work styles. Architectural elements, lighting, artwork, artifacts, sound and other elements of the overall design create a vibrant, welcoming ambience. “If you look at the WorkCafé, there’s a café and nourishment bar where you can access food all day long,” Johnson says, explaining how Steelcase encourages workers to use the space throughout the workday. If companies want to provide places of refreshment but don’t want employees to linger, they can provide fewer seating options. Just as coffee shops offer newspapers, magazines and community bulletin boards, in corporate third places a media wall that presents company news can help employees feel connected to the organization and their colleagues. Whether self-service or facilitated, hosting services can include printing support, tech support, office supplies, access to food and beverage and an on-site concierge. Hosting is ultimately about making employees feel connected to the organization and to each other. The way employees are welcomed and supported lets them know they are valued and demonstrates that the organization recognizes the challenges of work/life integration in a 24/7 global environment. The space should offer services, both self-serve and facilitated, supporting both the individual and work. Like any environment where people come and go, a corporate third place requires upkeep. “When everybody is using the space, who is taking care of it?” Johnson asks. “Who makes sure the markers and Post-Its are stocked?” At corporate third places, a work concierge can support people while they’re working, just as a hotel concierge supports guests. 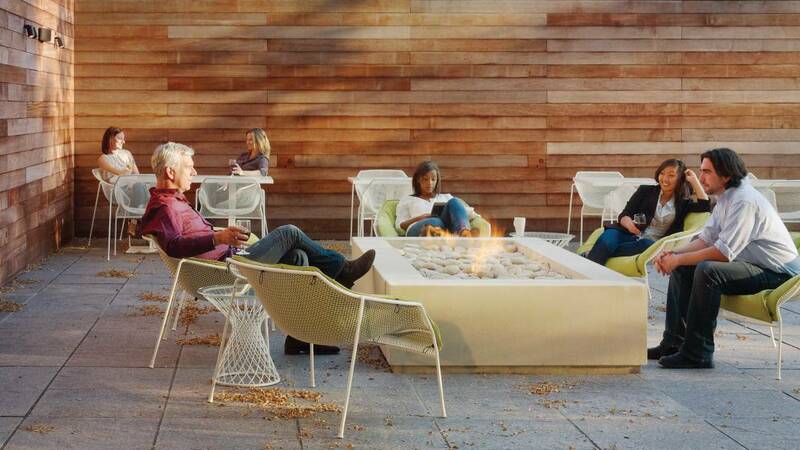 The outdoors are social magnets and provide the affordances of more casual work. 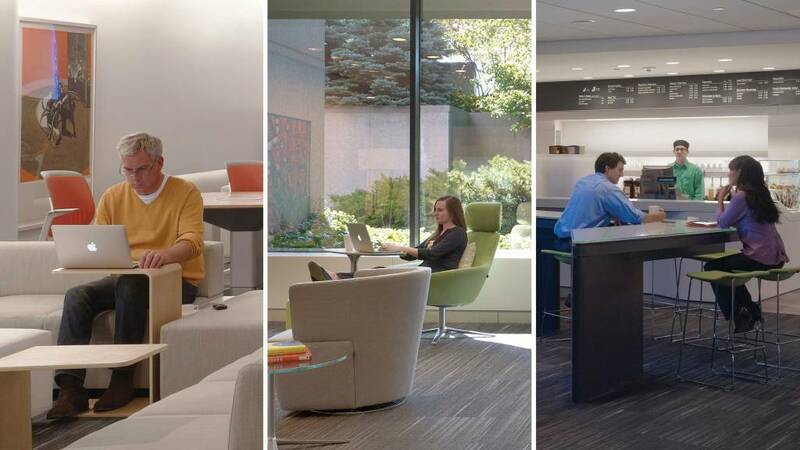 People naturally seek these spaces since they are restful but can also be highly productive. WHERE SHOULD YOU LOCATE A THIRD PLACE? The corporate cafeteria is an obvious place where a company can create a corporate third place and better leverage under-utilized real estate. It isn’t the only answer, though. A company might need more locations to hold meetings, for example. Johnson notes that some project groups often go off-site to hotels for meetings: “A floor of meeting spaces creates a destination where people can go for longer meetings, but that doesn’t mean they have to sacrifice time for travel,” she says. Exterior spaces can be designed for rejuvenation, and also for serious work. Courtyards, patios, and roof decks that are adjacent to the inside workspace can provide power, Wi-Fi and furnishings to support both individual and team work. 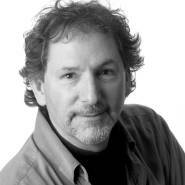 “People naturally seek nearby outdoor spaces that afford more choices and control for working,” Epstein says. 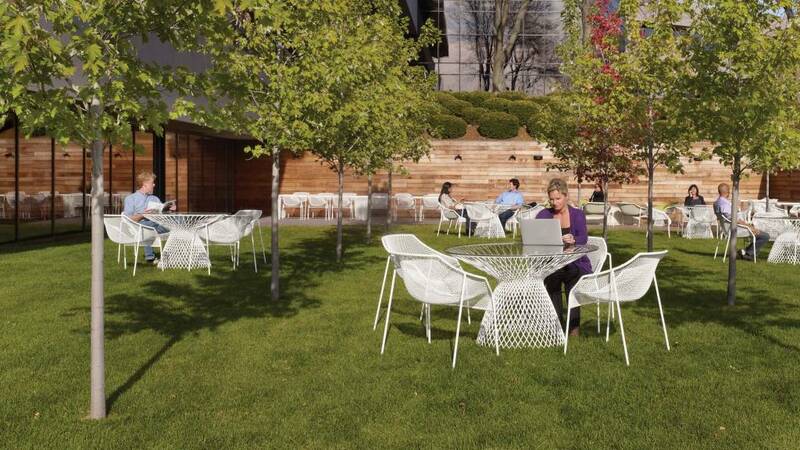 Such outdoor areas become social magnets and restful places to thrive, but also can be highly productive. “When you walk outdoors to have a meeting, you can see a look of refreshment come over people’s faces, even when they have a lot of work to accomplish,” Epstein says. Transform under-utilized real estate by creating an on-site third place where people can meet, work, network and re-energize. Among the best places to create one is where social exchanges are already happening, such as a cafeteria. A third place doesn’t have to be just one company-wide space. Businesses should be thinking about corporate third places at the “business level, neighborhood level and project level,” adds Graziano. It can be designed to support the entire company or campus, but at a smaller scale companies can offer a departmental getaway or zones where teams can shift between intense collaboration and relaxation. Large-scale displays such as this media wall are an effective way to share what’s happening around the company and help people feel more connected. To keep an organization’s investment in real estate resilient, it’s important that it be flexible. Also needed is a consistent feedback loop to make sure the company can learn from and adapt the space over time. 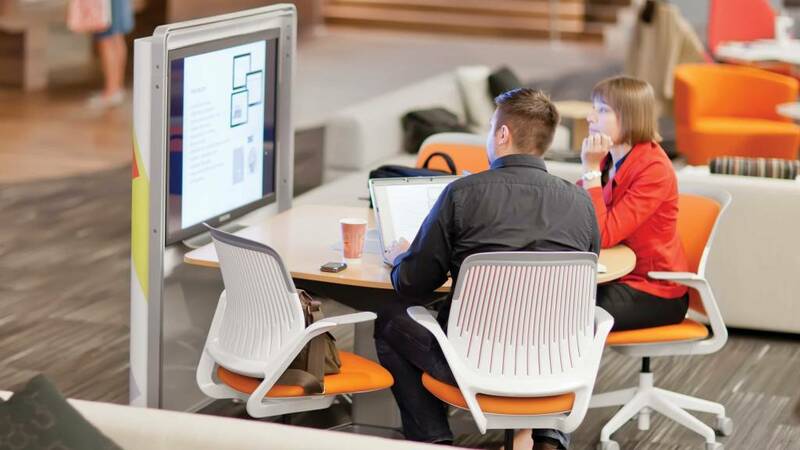 Steelcase routinely does utilization studies to see how employees are using the campus real estate to understand what’s working and what could be better. 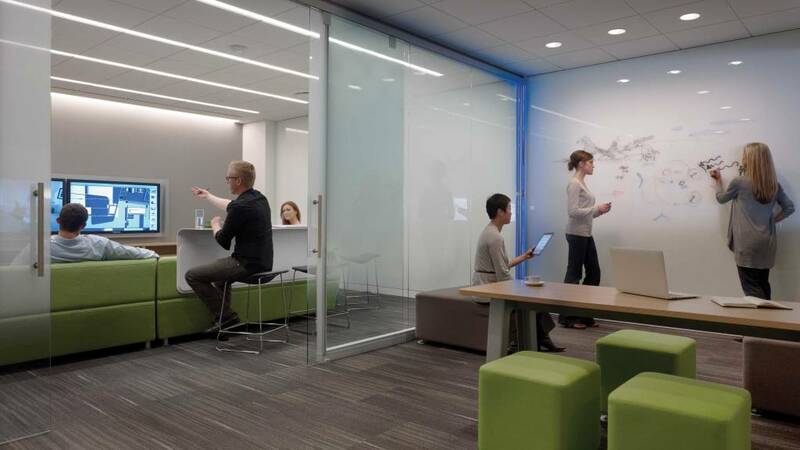 Steelcase found that enclosed, individual spaces in the WorkCafé were so heavily used that they needed to add more, distributing them through other work areas and buildings. The company initially had the coffee bar open into the evening to support longer work hours, but found that people were either staying in their work neighborhoods or going home to handle evening conference calls. So the coffee bar hours were adjusted to fit the use pattern. An office build-out that truly supports employee engagement and productivity is never really done—lessons are learned and adjustments can be made over time. 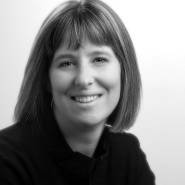 EMPLOYEE ENGAGEMENT: THE BIGGEST ADVANTAGE? When real estate and finances are limited, organizations might ask if adding a corporate third space to the office is really worth it. Yes, worker productivity, collaboration and worker health are good reasons, but the biggest reason for companies to seriously consider corporate third places is worker engagement. Fostering higher quality interactions, allowing employees to rejuvenate and helping them to feel inspired will support employee wellbeing, and ultimately lead to higher attraction, retention and engagement. The neighborhood coffee shop might make a good latte, but it can’t top these outcomes. This entry was posted in Distractions, Office Productivity, SteelCase, Well Being. Bookmark the permalink.